When developing new fields of application e.g. in assembly lines, robot manufacturers are confronted with two major challenges: The robots need more and more sensitive sensors; and they must become narrower and more flexible – in order to perform more complex assembly operations. 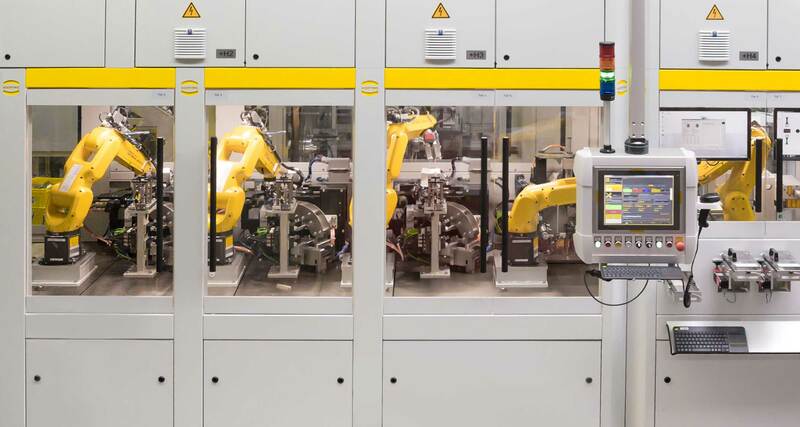 Han® industrial connectors can support the development of such robot systems – by accelerating miniaturisation and ensuring shielded data transmission. In addition to electrical signals, modular connectors can also transmit compressed air, light waves and high currents. As a “hybrid” interface, they fulfill the task of several small individual interfaces. In order to make optimum use of the space in the connector, HARTING has constantly increased the contact density of Han-Modular® modules. The Han® DD Quad Module is a dual module. It offers space for up to 42 Han® D contacts on a three-centimeter connector width. The contacts transmit power or signals up to 10 A / 150 V.
The second example is the Han® High Density Module: fully loaded, 25 D-sub contacts are located in the module, capable of transmitting signals up to 4 A and 50 V. Other Han-Modular® modules with even higher contact densities are under development. Monoblocks are a good alternative for applications providing only limited space for installation. The Han® 72 DD, for example, is often used to supply industrial ovens. Spanning a width of 78 or 85 millimeters, the Han® 72 DD inserts offer space for a total of 72 contacts that are suitable for the transmission of either signal or power. The inserts fit into Han® standard hoods and housings of size 16 B. For similar applications, HARTING has recently developed the Han® K 32/55 insulator. With 32 cavities for power or signal contacts (up to 10 A / 250 V) in addition to 55 positions for signal contacts (up to 4 A / 50 V), this "hybrid" connector does not require more space than the Han® 72 DD Monoblock (i.e. a 10 B standard hood or housing). For space and cost reasons, it may be advantageous to keep the number of robot interfaces as low as possible. The combination of Han® K 32/55 with a Han® 10 HP Direct housing can help. Contacts with larger (32 x 2.5 mm2, e.g., for power transmission) and smaller diameters (55 x 0.5 mm2, e.g., signals) are placed side by side in an insulator. In accordance with the “make two on one” principle, such an interface placed in a 10 B standard housing is sufficient to supply an industrial robot – including the control area – with power and signals. With the new developed Han® HP Direct operators can reduce the height of robot interfaces. Instead of a bulkhead mounted housing the Han® HP Direct comes with a flange onto which the hood can be screwed. One connection side, usually the one with the male contacts, is set into the robot’s foot, which reduces the overall height. The Han® 10 HP Direct offers more space: the hood is almost 2 centimeters higher than the high construction version of the B standard housing. Thus, the new Han® K 32/55 with its 87 contacts is easy to handle and can be comfortably inserted into the hood, the cabling included. Among other things, the gain of space is due to the use of locking screws. For users who do not want to refrain from a tool-free locking system, the Han-Modular® connector with the highest possible contact density – i.e. the Han® DD Quad Module – remains an optimal solution for a robot interface.